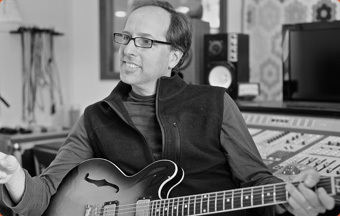 Billy Straus, music producer and songwriter, is known for his work across diverse genres of music and media. He began his career in 1979 as a remote recording engineer at Fedco Audio Labs in Providence, RI where he recorded artists including Miles Davis and Joni Mitchell as well as many episodes of the seminal radio series The King Biscuit Flower Hour for artists including AC/DC and The Grateful Dead. Billy's work took him to New York's legendary Hit Factory Studios where his projects included session work with Bruce Springsteen on "Born In The USA" and Julian Lennon's debut album "Valotte" along with sessions for Little Steven and Stevie Nicks. In 1985 Billy set up shop at The Manhattan Recording Company on west 14th Street where he produced an eclectic range of recordings including The Manhattan Jazz Hour series for NPR, national television spots for Miller Brewing and Nike, sessions with songwriting legend Jimmy Webb, and, one of the more unusual projects, a long form radio play recorded at the request of Moroccan King Hassan II featuring the Royal Moroccan Theatre Troupe performing “1001 Arabian Nights”. At MRC, Billy began his foray into children's music producing numerous albums for vocal supergroup Rockapella, including their ubiquitous theme song for the PBS series "Where In The World Is Carmen Sandiego? ", as well as producing recordings for artists as diverse as legendary bandleader Tito Puente, The Persuasions, and British pop icons XTC. Beginning in the mid 90s, Billy signed on as a musical director/songwriter for numerous television series at Nickelodeon, PBS, and Disney, and to date has penned hundreds of songs for shows including "Word World", "Gullah Gullah Island", "Dora The Explorer" and "Out Of The Box". Billy's music, for which he has won an Emmy Award and a Grammy Award nomination, is heard daily on television in many countries around the world. In 2000, he and his family moved to Vermont where Billy continues to produce an eclectic range of projects at The Barn, including writing music and lyrics for "Rock Odyssey", a stage adaptation of Homer's Odyssey produced at The Miami Performing Arts Center, co-producing tracks for singer Shawn Colvin and Broadway cast albums for "The Full Monty" and "Dirty Rotten Scoundrels".